A couple of issues ago we told the story of Clar Hedley and his experiences as a Japanese Prisoner of War. Shortly after publication, we learned of 94 year old Eddie Howlett, another ex FEPOW, who lives near Amble. 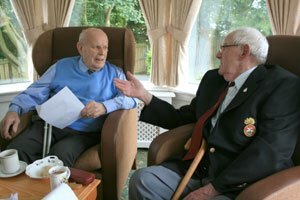 Eddie and Clar met up for a cup of tea and to exchange memories of their time in the Far East during the Second World War. Eddie’s story included many of the same places and events as Clar’s, and the two veterans reminisced all afternoon. Eddie Howlett was born in Ipswich in 1917. He was a butcher in Islington before he enlisted in the 4th Battalion Norfolks. In 1941, he married, just before he was posted abroad. For the first two years, his wife Vera didn’t know if he was even alive. Like Clar, Eddie was taken prisoner in Singapore and held in the Changi camp in 1942. The following year, he was taken 900 miles up to Banpong in Thailand. There were 30 – 40 men in one carriage with very little food or water. From there came “the long walk” as Eddie described it with his quiet, dry sense of humour. He and 3000 British soldiers were forced to march through the jungle to Songkurai near the Burmese border to begin work on the railway. The 294km journey took 19 days; they were forced to march through hilly jungle with no boots or kit. Any stragglers were bayoneted or left to die. When they arrived at their destination the soldiers discovered they would have to build their own huts and clear more jungle to build the railway. Illness and malnutrition were rife and after eight months, only 1000 of the 3000 British soldiers had survived. Eddie and the other Far East prisoners were liberated in August 1945. After the war, Eddie returned to London and his butcher’s job. He and his wife retired to this area in 1980-81 to be near their daughter. *This article has been amended. Eddie was in 4th Battalion, not as previously written. One thought on "When Clar met Eddie"